The construction industry already has the dubious distinction of having some of the highest rates of workplace-related fatalities due to falls. A new study finds that among all construction workers, roofing workers have the highest risk of dying in fall accidents. 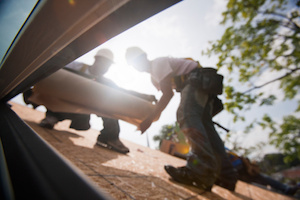 The report by the Center for Construction Research and Training Data Center found that between 1992 and 2009, roofing-related falls accounted for approximately one-third of all fatal falls in the U.S. construction industry. Workers in the roofing industry are up to three times more likely to die in a fall-related accident than other construction workers. In fact, falls account for three-fourths of all workplace fatalities in the roofing industry. During the study period, there were 20,498 fatalities from workplace accidents in the construction sector. Roof-related falls contributed to more than one in 10 all workplace fatalities. Atlanta construction contractors and employees need to be particularly aware of the risk of falls from roofs. Some categories of workers seem to be at greater risk than others. These include Hispanic and immigrant workers who have a disproportionate risk of being killed in a fall from a roof. The data also indicate that people who work for companies that employ 10 or fewer workers are more likely than those who work for larger employers to suffer a fatal fall accident. Fall prevention efforts should focus on smaller companies and workers at highest risk, the researchers concluded.